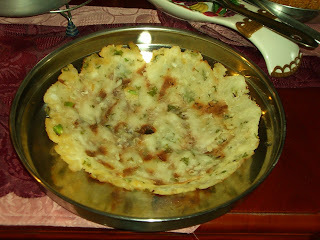 Akki roti | Rice Flat Bread| Karnataka Style! Mix all the above ingredients in hot water and make soft dough. Leave the dough to rest for half n hour to an hour. Take a tawa or kadai, apply oil and start spreading by hand. Heat the same and cook both sides till brown. This will be crispy and can be served with groundnut or coconut chutney or chutney pudi.